Above is a partial section of the opening of John Keats ‘To Autumn’ a famous and moving piece of poetry. It’s a glorious read but to a foodie seems to mean so much more, an understanding of how the seasons change and how it affects our day to day lives and of course our diet.It is considered the perfect embodiment of poetic form, intent, and effect and was written in Winchester on 19 September 1819 and first published in 1820. To this day the words are still relevant, to many at least, despite the year round availability of goods from supermarkets from far away shores many are reverting back to eating at a seasonal pace; something I wholeheartedly agree with. Sure there are things we need that simply cannot be produced here such as some spices e.g. vanilla, cinnamon and nutmeg to name but a few, as we have totally the wrong climate but all we can grow here we should and as for exporting our ‘home grown’ to import another countries produce of the same goods (such as prawns) I find that utterly disgusting, but once again I digress. Back to the preserving pot for me, this time spiced apple jelly the produce. Here making the most of the seasonal apples with a little help from far away grown friends star anise and cinnamon, oh and a few hibiscus petals along the way to help with the colouring. I used half windfall apples and half sweet dessert apples as I’d some lurking in the bottom of the freezer, but all windfalls or crab apples would be fine. 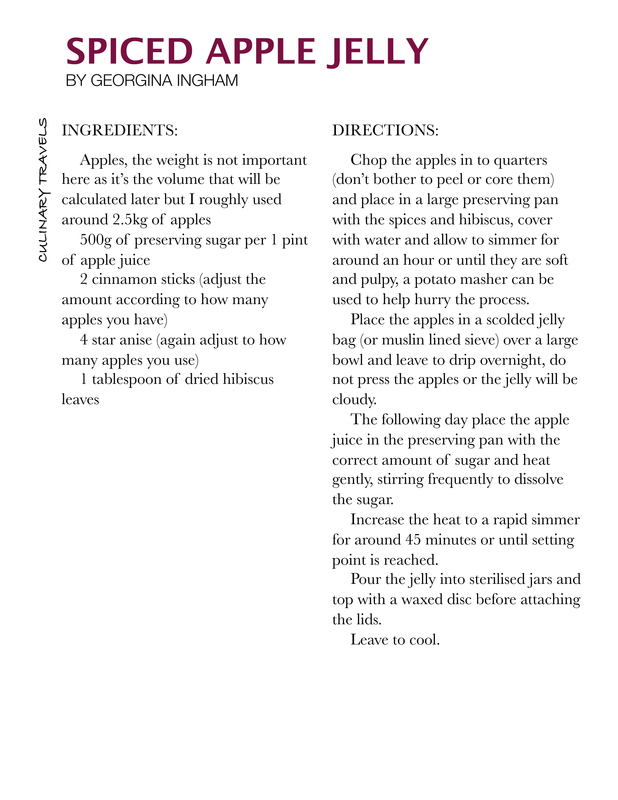 Fruit jellies are incredibly easy to make, if not a little time consuming as the process is spread over two days. The wait is well worth it though. Fragrant and gently spiced, giving a warming undertone to the jelly. Perfect for serving on toast/breads or even with roast meats, especially lamb or chicken, either warm or cold.